Flap-neck chameleon (Chamaeleo dilepis). A very cool grassland chameleon from the iSimangaliso Wetland Park. Cheetah cub from Cheetah rescue centre, South Africa. White rhino, Hluhluwe. One of over a hundred sightings during less than a week. Field trip with biology students to Sabah, Borneo. 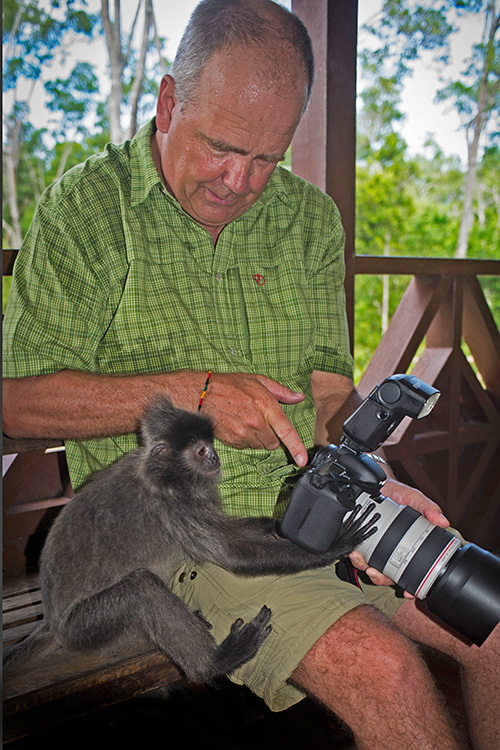 The pictures were taken mainly in Danum Valley, while the monkeys are from Labuk bay. And, yes, the guy with the grey hair is Sir David Attenborough, making his umpteenth nature film. Manatees, Key deer, Everglades birds and reptiles as well as a few other pictures from Florida. The pictures of the manatees were taken under a license from the US National Fish and Wildlife Services, Crystal river. All rules for photography of manatees were adhered to. How tame are animals that are not afraid? During my recent trip to Asia, I visited a couple of places where animals never experience hunting. One of these was the Labuk Bay proboscis centre just outside Sandakan in Sabah, Borneo, created primarily for proboscis monkeys living in a remnant of forest surrounded by palm oil plantations. The proboscis monkeys are supplementary fed regularly at the centre, and at times even grey leaf monkeys visit the feeding areas. Some of the grey leaf monkeys accept vegetables, while other individuals seem to be less interested. However, all the grey leaf monkeys show very little fear of people, to the level where some of them interact freely with visitors. The young female in the picture above actually looked at the pictures I showed her on the screen of my camera. The proboscis monkeys also show an amazing lack of fear, with certain dominant males ignoring people irrespective of distance. 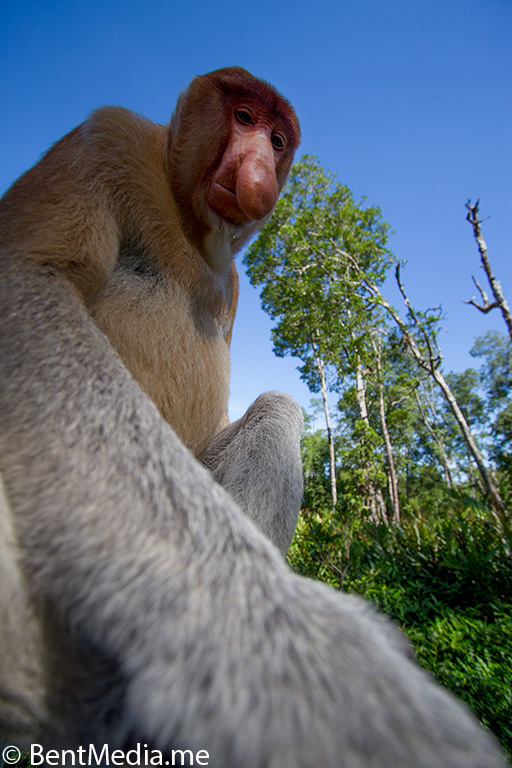 Proboscis monkey, allowing me to approach close enough to be able to take a wide-angle picture starting at its hand. The second place I visited with no hunting or other persecution of animals was the Danum Valley field centre outside Lahad Datu, also in Sabah, Borneo. This research centre has been active for more than 25 years, with a total protection for all animals inside the protected area. 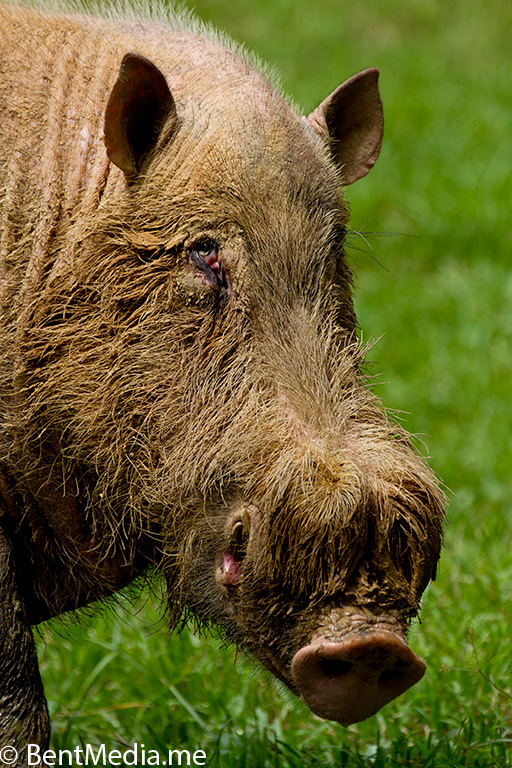 Some animals live close to the field centre itself, and become incredibly accessible. 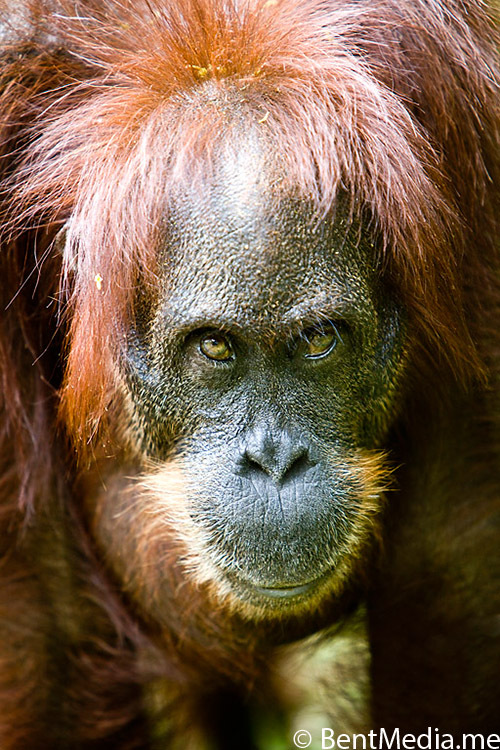 One wild orangutan has totally lost her fear of people. 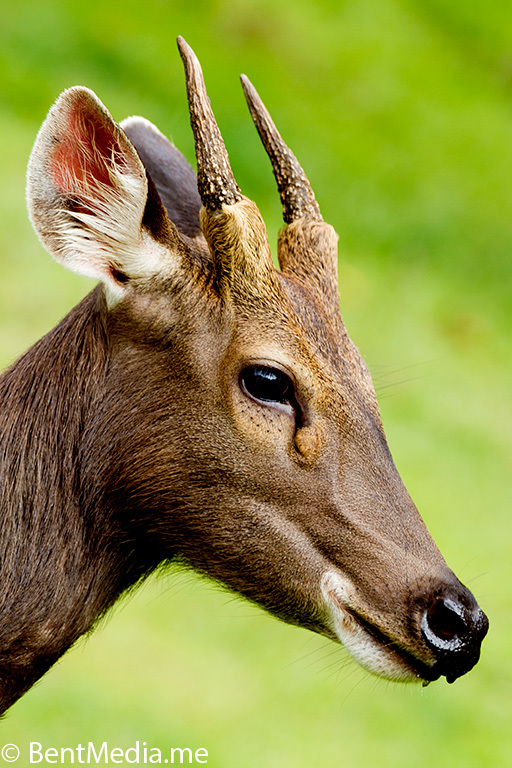 In Danum Valley, there is also a resident herd of Sambar deer. These deer are generally hunted outside protected areas, and are shy there. In the Danum area, all deer let visitors approach to around 15 metres, while some of the deer have become so tame, that they can be petted and hand fed. 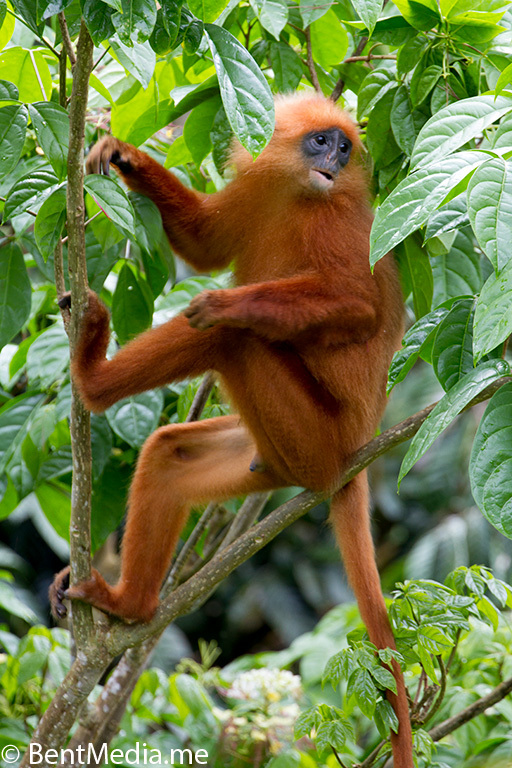 Bearded pigs and other animals, such as longtailed macaques, some civets and tree shrews seem to very quickly loose their fear of man in protected areas. So, what is my point? Animals that are not shot at are less afraid! That is not a major revelation. But there is a consequence to the hunting and other activities that are not often discussed. As an avid animal watcher, I find most animals very hard to find, and even more so, really hard to actually follow and study. That is outside protected areas. Inside protected areas, many animals are very easily observed and do behave seemingly natural even in the presence of humans. On a scientific notion, such observations give a lot of information on the ecology of such animals. Furthermore, on a more societal notion, to many people including myself, it is a great experience seeing wild animals behave naturally in their environment. I wonder what a world without any hunting and other similar activities directed towards animals would be. It is easy to envision some kind of “Eden”like place where we could interact with animals in a much closer way than we do now. I would for one really like to try it. All animals portrayed in this entry are wild, are not restricted in movements in any way and are free to leave and go wherever they will. None of them are captive bred, and none have ever been in captivity. All allowed me within 5 meters distance, and some obviously even closer without any sign of stress.